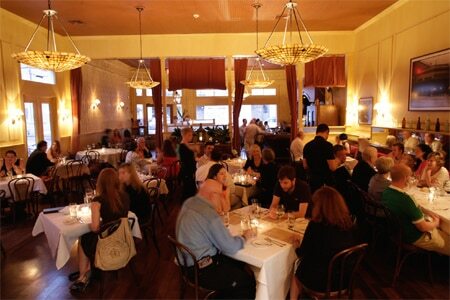 Busy Magazine Street offers upscale dining at La Petite Grocery. : This circa 19th-century building that once sold “fancy groceries” experienced a rebirth when chef/owner Justin Devillier artfully transformed it into a quaint, uptown restaurant, with an eye-catching wall-long bar, nicely spaced tables and just enough local charm to display its enviable history. In an increasingly restaurant-rich part of Magazine Street in Uptown New Orleans, La Petite Grocery stands out for creative, well-executed cuisine. Chef Devillier excels with French classics (don’t miss the blue crab beignets with aïoli) and a light touch. Impeccable ingredients, many locally grown, are showcased in a polished but unpretentious manner on a seasonally updated menu. Appetizers might range from steak tartare and grilled octopus to ricotta dumplings. Among the entrées, we like the pan-roasted beef tenderloin and the “Louisiana bouillabaisse," which rotates off the menu from time to time. The signature burger features house pickles, onion marmalade, arugula, whole grain mustard, aïoli and Gruyère on a soft bun, served with hand-cut fries. The wine list is ambitious for such a small restaurant, but the smart balance of domestic and European selections is well-conceived. Look for a good lineup of by-the-glass choices, too, as well as several surprise offerings. From the ever-evolving dessert list is a Louisiana cane sugar crème brûlée and a coconut cream tart.